WHICH TEAM WILL SURVIVE ON THEIR ISLAND? Like the original Duel Game™ two adversaries square off in a game of skill not strength, but this time instead of one on one, it's two to six per team making the DUEL even more challenging. 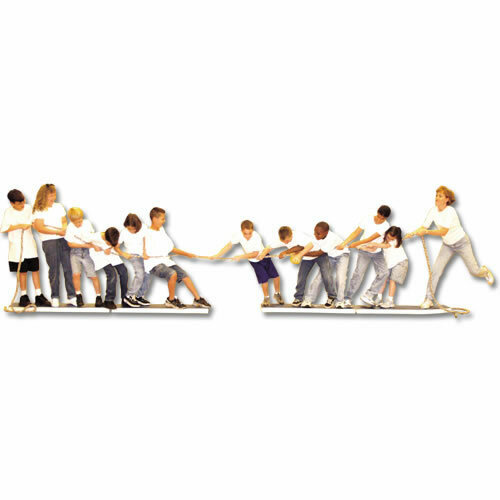 Yes, it looks like a tug of war game but if you play like tug of war your team will lose. The rules are simple. Last person standing wins or first team to lose a member loses. What strategy will your team use? Who will think out of the box to outwit their opponent. Comes complete with two 8' interlocking island platforms that can be taken apart into 4' sections for storage. Also included are a Cotton Duel Rope, rules and instructions.